Demolition Services | Building-Pool-Concrete | Best Hauling Co. Greater Cincinnati's "Best Hauling Company"
provides property cleanup and hauling services for residential and commercial clients. At the end of the day, you don't want just anyone to stop by and level out your home or buidling. You deserve to have a company take time to make sure every item that's important is accoundted for and removed from the premesis prior to demolition. The professional demolition services of Best Hauling ensure that all renovations run smoothly at the deconstruction and demolition stage of your project. 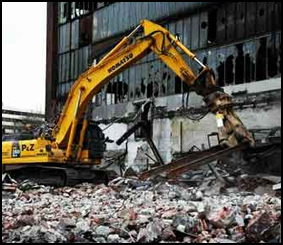 We offer both hard and soft demolition, and we’re capable of handling projects of any size and complexity ranging from signle-room demolition to the removal of multiple buildings. If you’re not sure your project is within our capabilities, just fill out the form to the right and we’ll reach out to you to discuss!